Easter Celebration Oreo? Cookies is rated 5.0 out of 5 by 5. Rated 5 out of 5 by JBGolf5 from Absolutely marvelous cookies for any age! Absolutely marvelous cookies for any age! Delicately sorted and lovingly placed in package. A real must have. Rated 5 out of 5 by YumYum58 from Excellent Choice! Absolutely delightful Easter cookies for the loved one on your mind. Our son received his scrumptious cookies and devoured every bite with immense childhood memories! Great college gift! Rated 5 out of 5 by Retiredteacher from Easter Celebration Oreo Cookies Sent as a gift I sent the treat to my mom for Easter, she is 89 and she was surprised and ate two upon arrival. She stated they were excellent...mom is not generally into sweets. Great way to sent a love gift and celebrate Easter when living 8 hours away. Thanks Gourmet Gift Baskets! Rated 5 out of 5 by well2do from Exquisite cookies! Purchased Easter cookies and they were delightful! 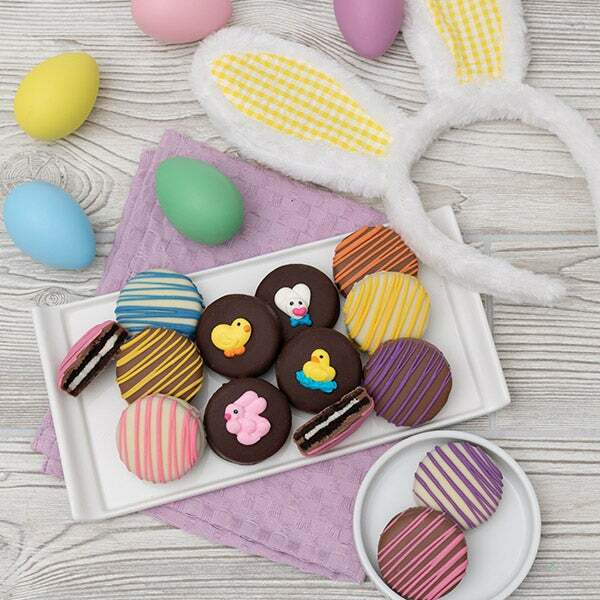 We've made their favorite cookie into the perfect Easter treat! We've taken classic Oreo® Cookies, dipped them into our imported Belgian chocolates, embellished them with festive appliqués, and drizzled them with delicate ribbons of our signature chocolate confection.